Be the first to share your favorite memory, photo or story of Wade. This memorial page is dedicated for family, friends and future generations to celebrate the life of their loved one. 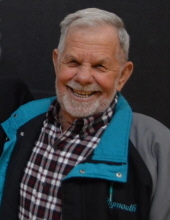 Mr. Wade Jones Miller, age 79 of Millers Creek, passed away Tuesday, April 2, 2019 at Forsyth Medical Center. Funeral services will be held 3:00 PM Saturday, April 6th, 2019 at Millers Creek Baptist Church with Rev. Shannon Critcher officiating. Burial will be in Piney Ridge Baptist Church Cemetery. The family will receive friends from 1:00 until 3:00 prior to the service at the church. Mr. Miller was born August 6, 1939 in Ashe County to Lee Miller and wife Mira Elizabeth Miller. He retired from Miller Engineering as an Equipment Operator and Job Foreman. Mr. Miller was a member of Millers Creek Baptist Church. He was a humble man, full of life and love who cherished his wife of 53 years and his family. He enjoyed working, gardening, classic Mopar cars and laughing. In addition to his parents, he was preceded in death by a sister; Nadine Craven and three brothers; Earl Miller, Vaughn Miller and Dale Miller. He is survived by his wife; Iva Deane Bowlin Miller of the home, a daughter; Kim Gambill and husband Tommy of Millers Creek, a son; Neil Miller and wife Nina of Ferguson, three grandchildren; Kyle Gambill, Jenna Miller and Myra Gambill, a sister; Ruth Seagraves of Greensboro and two brothers; Ford Miller of Marion and Ralph Miller of Glendale Springs. Flowers will be accepted or memorials may be made to Millers Creek Baptist Church PO Box 559 Millers Creek, NC 28651 or the American Cancer Society PO Box 9 North Wilkesboro, NC 28659. To send flowers or a remembrance gift to the family of Wade Jones Miller, please visit our Tribute Store. "Email Address" would like to share the life celebration of Wade Jones Miller. Click on the "link" to go to share a favorite memory or leave a condolence message for the family.